Nestled in the secure gated community of Calabay Parc. We are very pleased to welcome you to our family owned and family friendly spacious 4 Bedroom, 3 Bathroom villa. The villa is situated within the small community of Calabay Parc tucked away just off Highway 27 in a peaceful location. 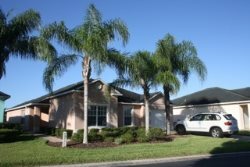 It is close enough to enjoy the shopping malls, golf courses and theme parks that are located in Orlando, Florida including Walt Disney World, Sea World and Universal Studios. It also has easy access to Highway 192, Interstate-4 and other routes to Tampa and the Gulf Coast in the west along with Daytona Beach & the Kennedy Space Centre in the east. This villa will accommodate 8 people comfortably and enjoys a south facing pool for year round sun with an oversized deck and an impressive lanai for enjoying a meal by the pool in the evening. The villa is of course fully air conditioned for maximum comfort. Inside there are two impressive master suites, each with their own bathrooms and two twin rooms which share a centrally located bathroom. There is a games room with a pool table, air hockey and a dart board. Private south facing pool with screen (Heated on request) Extended pool decking area with loungers Large well furnished and covered Lanai which provides some shade outside Large patio doors leading directly from pool area to family living room 51" Plasma flat screen television, DVD player & selection of films HD digital cable TV Free high speed wireless internet available throughout the villa Separate formal dining area Stylish new modern furnishings throughout 2 Master bedrooms with en-suite bathrooms and TVs incorporating a DVD player Pool access from both master bedrooms 2 Twin bedrooms both with TVs incorporating a DVD player Family bathroom Fully equipped kitchen including microwave & dishwasher Laundry room with washing machine & tumble dryer Towels (including beach towels) & Linens provided The kitchen is extensively equipped for cooking a large family meal or simply for breakfast and snacks. Calabay Parc is located on Highway 27. The front gates of Disney World are only 15 minutes away along with all the other fantastic attractions. It is also located only a few minutes from the challenging Champions Gate golf courses. A good selection of shops and restaurants are only minutes away. Our villa will have been prepared & pre-checked for your comfort and our Management Company are on hand if you have any question or problem during your stay.